Don’t head down the aisle without consulting our guide to popping the question and prepping for the big day. Mark Pomerantz is a local favorite for his custom suiting. You’re ready to propose, but what’s next? The wedding planning process can be daunting for everyone involved, but it’s especially intimidating to the groom, most of whom haven’t been inundated with bridal magazines since childhood. To streamline the process, we’ve compiled some recommendations to get any groom-to-be ready for the big day. So whether you’re wondering where to hold your bachelor party or trying to decipher just what the four C’s really mean in the diamond industry, we’ve got you covered with this easy-to-follow guide. Strolling the grounds of one of the luxury hotels that dot the coastline. For Aaron Stapp, who recently married his wife, Cristen, the pathway that snakes around Montage Laguna Beach was just the right spot to drop to one knee. When it came to perfecting the details, Aaron called on his mom, who also lives in Laguna, to help execute the plan. “We told Cristen, my wife, that we were all going to a barbecue at my mom’s but that we should go on a walk before the barbecue. She went along with it! My mom and sister were nice enough to set up a trail of rose petals, chilled Champagne and a rose bouquet on a bench down by the Montage. As we walked down the path getting closer and closer to the bench where everything was set up, [she] knew it was about to happen,” Aaron says. As the two approached the setup, he got down on one knee—and the rest is history. Staffers at the Pacific Edge Hotel are available to assist with planning and executing romantic proposals. 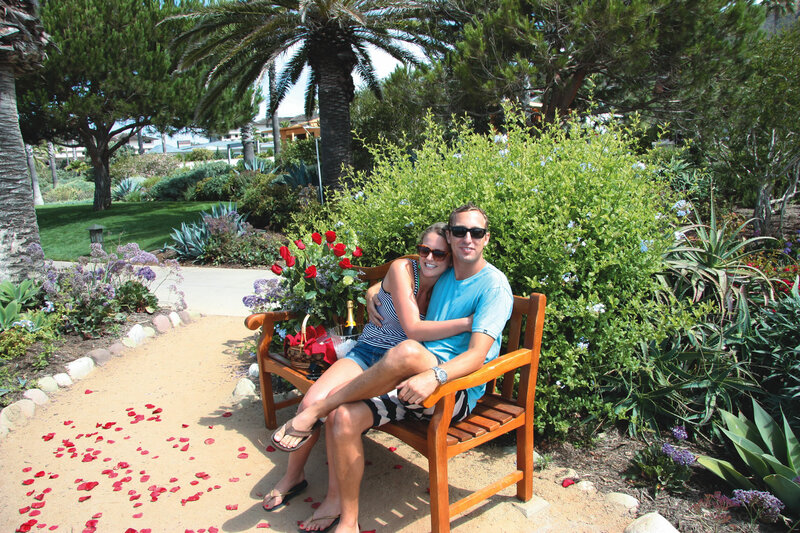 Aaron was lucky enough to be able to involve his Laguna-based family in pulling off the plan, but for full-service assistance with a proposal, consider capitalizing on the expertise of a local hotel’s staff. Places like the Pacific Edge Hotel are known for their indoor and outdoor beachfront spaces, sweeping ocean views and on-site staffers who specialize in tying up any loose ends. 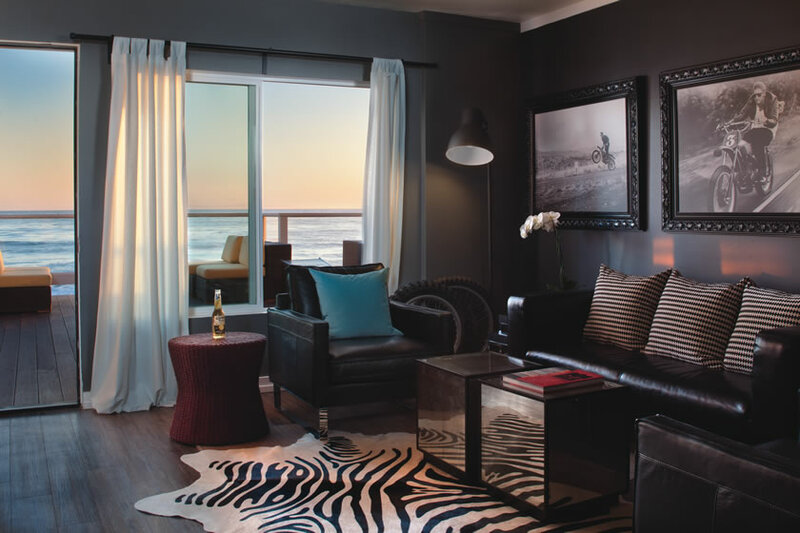 The Pacific Edge Hotel’s ocean-view indoor/outdoor bungalows make for great bachelor party locations. Now that the surprise of the proposal has worn off, it’s time for you to choose wedding bands together. 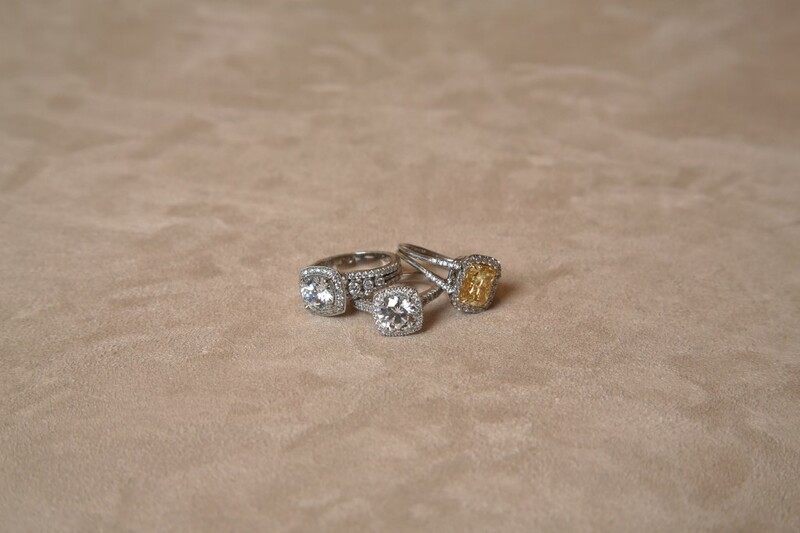 Some couples opt for matching styled bands, or engravings of their initials or wedding date inside the ring. Whichever style you choose, make sure it will endure time and perhaps even have the strength to become a future family heirloom. Laguna jewelry store Fredric H. Rubel has been in the business of creating keepsakes for more than 80 years, and owner David Rubel has helped countless grooms-to-be find perfect sets of rings. Along with that advice, it’s also key to understand the various types of rings as well as what drives the cost of an engagement or wedding ring. The price of a diamond is determined by the four C’s: cut, clarity, carat and color. Cut refers to the diamond’s shape, a determination based on how the facets of the diamond are arranged, and a quality cut can more than make up for a smaller diamond’s size. Clarity refers to the internal flaws of the diamond as well as any external blemishes. These flaws typically aren’t visible to the naked eye, but the fewer the flaws, the more valuable the diamond. The carat, simply put, is the weight of the diamond. A diamond’s color is rated on a scale from D to Z. A diamond that merits a D rating is virtually colorless and holds the most value, while a diamond given a Z rating shows traces of yellow or brown coloring. Naturally colored diamonds, which are sometimes called “fancies” and come in colors like pink and yellow, aren’t rated using the D-to-Z scale and, depending on the color of the stone, can be very expensive. The engagement ring and wedding bands could easily be the priciest aspects of your wedding—protect these investments by getting the rings professionally appraised and insured against loss or theft. Even the most rugged jeans-and-T-shirt groom wants to look stylish on his wedding day. 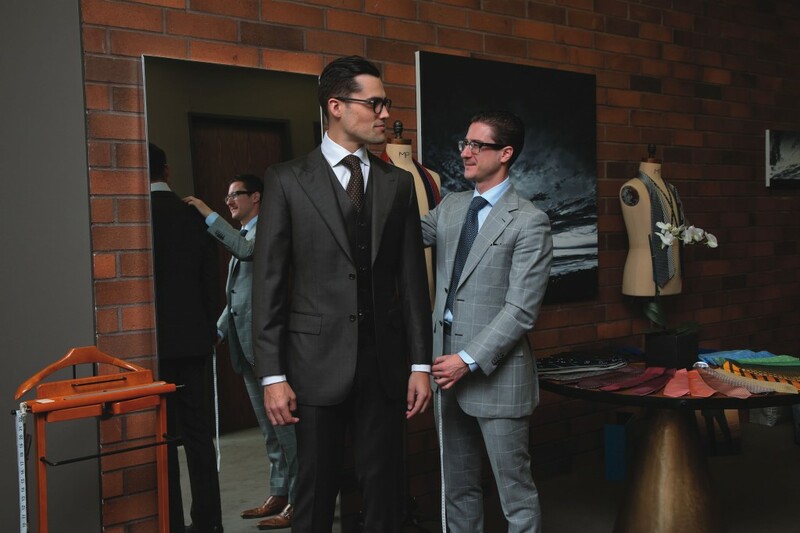 Whether you prefer a classic three-piece suit, a formal tuxedo or a slim-fitting jacket-and-tie combo, any form of attire can be customized to complement your personality. At a formal wedding—especially one that denotes a black-tie dress code—a classic black tuxedo is the only appropriate choice. For spring and summer weddings, a white dinner jacket is the ideal substitution for the traditional black. Daytime weddings, casual weddings and beach weddings all call for lighter colors and fabrics, like a gray or blue suit with a white shirt, or even linen trousers. 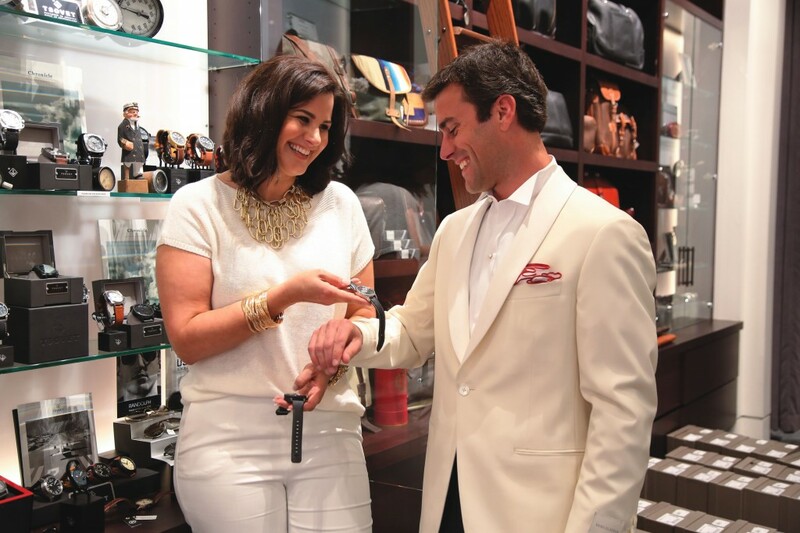 Laguna Beach-based professional stylist Leslie Christen helps a groom choose accessories for his big day at Garys, a men’s specialty store, in Fashion Island. Asking for help never hurts, and Orange County is rife with professional stylists who can help grooms put together tasteful outfits for the big day. Leslie Christen, who has styled St. Regis guests for years and is the fashion editor for lifestyle website Greer’s OC, takes clients to South Coast Plaza and Fashion Island for the most diverse selections of apparel. “Every time I go there, I know I’ll get exactly what I want for my clients,” she says, adding that she also favors local boutiques and values the one-on-one relationships she’s cultivated with their owners. Leslie lists Mark Pomerantz in Newport Beach for custom suiting, Garys and Penguin in Fashion Island and Simple in Laguna Beach as some of her personal favorites. Best of all, a stylist can help with much more than choosing the right bow tie or debating the strengths of a navy or black suit—they’re also qualified to handle tailoring, coordinate the drop-off of the groom’s clothing and make sure that everything is perfectly pressed for the main event. As the wedding date approaches and with most of the planning behind you, relax and give in to a bachelor party. Choose your best man carefully, as he’s the one who’s usually tasked with planning the epic night out. Forget Vegas and opt for a local stay-cation—one where artisanal cocktails are flowing and oversized flat-screen televisions are showing the big game, of course, but also one that’s just a short drive from home come checkout time. The Pacific Edge has been something of a secret spot for bachelor parties ever since the hotel transformed five oceanfront rooms into day-use, indoor/outdoor oceanfront bungalows. “The bungalows are a great go-to for bachelor parties, whether you rent a bungalow for up to 12 guests or take the whole space,” Bill says. Bachelor parties can check in for the day, order room service, relax in a living room that overlooks the ocean or tan on the private, oceanfront deck area. When the guys are ready for dinner, Laguna offers eateries ranging from bustling downtown restaurants to waterfront venues with unbeatable local views. Tucked inside the Mediterranean-style Surf & Sand Resort is Splashes restaurant, where guests are served on an outdoor patio that overlooks the Pacific Ocean. Award-winning Executive Chef David Fuñe, who has appeared on Food Network’s “Chopped,” creates California coastal cuisine that’s delightfully raw and fresh. Indulge in light but filling fare like ahi tuna tartare with Sriracha sauce, lightly fried artichokes and Brussels sprouts, and sea scallops with asparagus risotto. Afterward, bring the crew to La Casa del Camino’s Rooftop Lounge for drinks. The Spanish-style hotel’s intimate deck has panoramic ocean views and a full bar. Watch the sailboats, spot whales and order appetizers from chef Craig Connole’s hearty menu—think warm baby brie with wild berry sauce and toasted almonds, or a charcuterie platter with pate, prosciutto and salami. For those lucky locals who decide to get hitched in Laguna, there are countless awe-inspiring locations to celebrate in town. 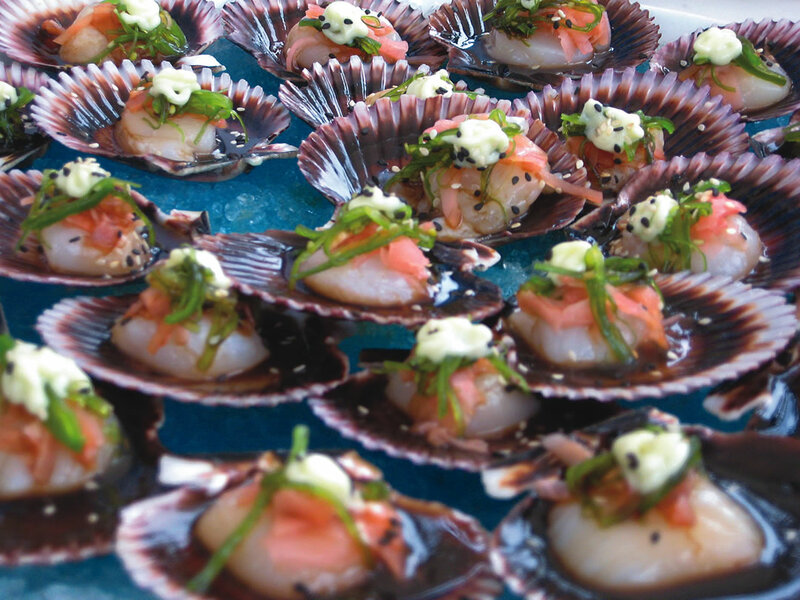 Oftentimes, though, the food you serve is just as important as your wedding’s home base. Here, you’ll find some of our favorite spots that offer catering guaranteed to make your reception as flawless as your ceremony.